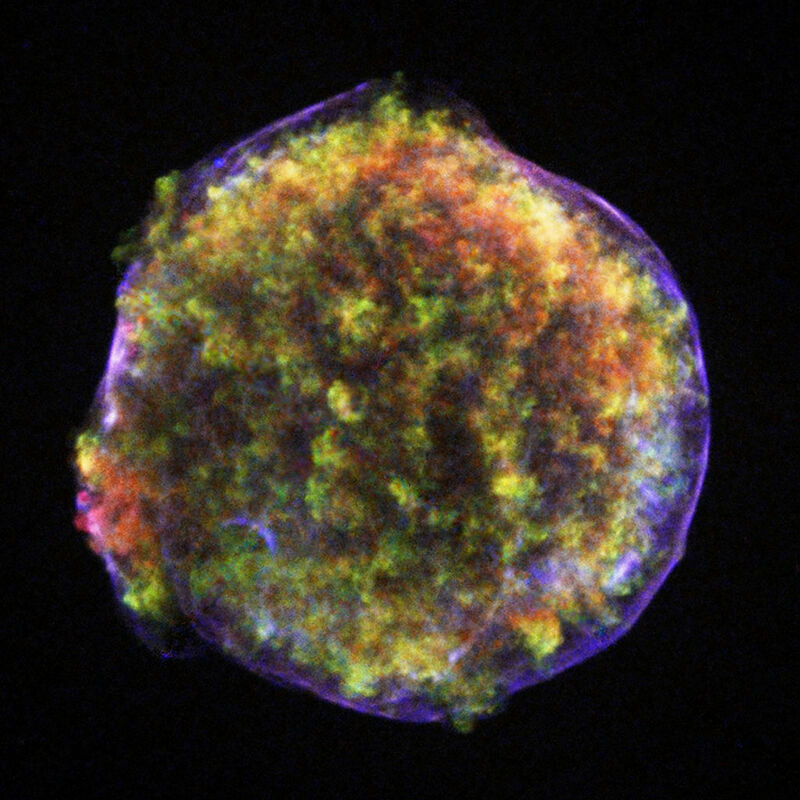 Tycho’s Supernova Remnant (source of image: NASA/CXC/Rutgers/J.Warren & J.Hughes et al.). As our Digital Project Managers conduct a game of international musical chairs (more of this in a forthcoming blog), we would like to draw your attention to the Tycho Brahe correspondence catalogue which is available now for consultation within EMLO. Publication of this metadata is a truly stellar achievement (please excuse the pun) and one we are thrilled to be able to celebrate at this particular juncture. Whilst researching his Cambridge University Press monograph, Bearing the Heavens. Tycho Brahe and the Astronomical Community of the Late Sixteenth Century, Professor Adam Mosley assembled a large quantity of metadata on astronomical correspondence from the later decades of sixteenth and early years of the seventeenth centuries. In providing this metadata for publication in EMLO, Professor Mosley has done significantly more than contribute the first instalment of what we intend will become a representative archive of important astronomical correspondence within the union catalogue. His work has also helped pioneer the manner in which a ‘legacy’ dataset may be enhanced and prepared for upload by a CofK-funded Digital Fellow using EMLO-developed tools and procedures under the guidance of the specialist scholar. Indeed, so successful was the pilot approach with Tycho — in which our inaugural Digital Fellow, Rose Hedley, worked under Professor Mosley’s supervision — that it is used now on a routine basis to prepare EMLO metadata for upload. 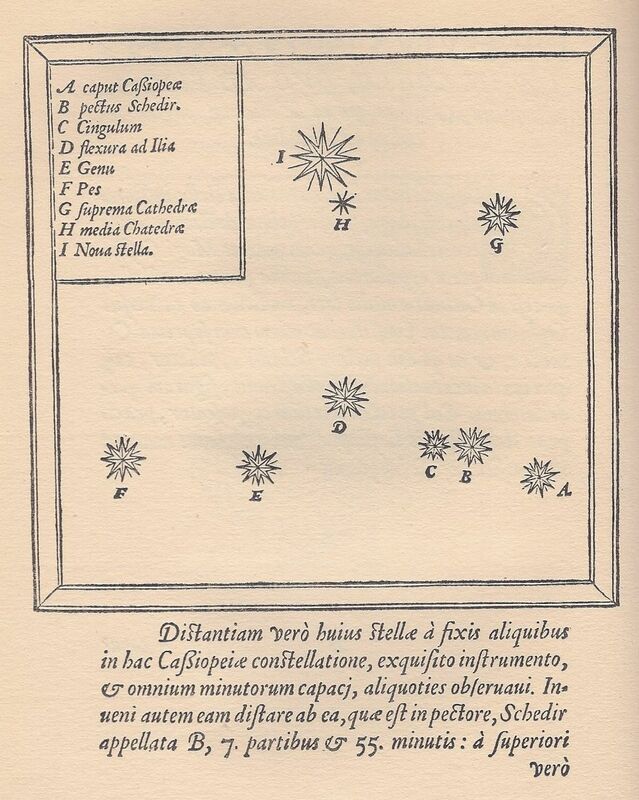 Tycho Brahe’s map of the constellation Cassiopeia showing the position of the supernova of 1572 (source of image: Wikimedia Commons). The Tycho catalogue, which contains metadata of the letters published in J.L.E. Dreyer’s 1913–1929 edition Tychonis Brahe Dani Opera Omnia, is made up currently of 498 letters, which link directly to printed copies where these are available on the Internet Archive. The catalogue is to be supplemented later this year by metadata for additional letters not published in the Opera Omnia, once again under Adam’s expert supervision; we’ll let you know when this enhancement is made, and, in the meantime, we hope very much that you enjoy the bright dawn of EMLO’s astronomical letters and trust you’ll be as excited as we are to know that Tycho is set to be the trail-blazer for a rapidly lengthening procession of early modern greats. This entry was posted in Uncategorized on May 20, 2015 by Miranda Lewis.